When camera is the catch word! In this new era, people thought that camera has lost its sheen in front of technological revolution by way of mobile and internet.But the truth is far from that. Amidst all the hullaballoo and the rough weather, camera has managed to row its boat and is very much ‘Alive and still Clicking’. This is good news for retailers. The India digital camera market recorded a growth of 76 percent YoY (April-June 2010 over April-June 2009). The overall market crossed 6,20,000 units for the first time in a single quarter in Q2 CY2010. The digital single lens reflex (DSLR) camera category witnessed a significantly higher uptake, chronicling a growth of 557 percent YoY. This has been revealed in IDC's India Quarterly Digital Camera Tracker, Q2 2010, and August 2010 release. In the point-and-shoot (P&S) camera category, Sony was the market leader with market share of 24 percent in terms of unit sales (shipments) during Q2 CY2010, followed by Nikon with 21 percent, Canon 16 percent and Kodak 14 percent. In the DSLR category, Nikon was the leader with a 55 percent share in terms of unit shipments during Q2 CY2010, followed by Canon with a 32 percent share. For stage photography Kodak cameras are suggested but if you need pictures during sporting events or outdoors, Canon might be a better choice for you. 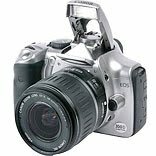 There are a lot more Kodak digital cameras sold every year, but the cameras of choice for professional photographers are either Canon or Nikon. With optimistic domestic demand for the digital single lens reflex (DSLR) cameras and the growing competition, Canon India is moving a step ahead to increase its revenue channels. The company plans to launch 300 stand-alone stores with an investment of 150 crores, Canon Image Square, over the next three years across India. The company is aiming to increase its visibility through standalone stores and strengthen its brand position in the country. Canon expects to cross Rs1,260 crore revenues in 2010, compared with Rs840 crore revenue in 2009. The first 100 stores will be spread across six metros, whereas 200 stores will be located in Tier-II and Tier-III cities. While revealing the company’s future plans of entering franchising model, Alok Bharadwaj, Senior Vice President, Canon India shares, “Competition has quite stepped up now. Nikon getting active, Sony has been very active anyways. Now we have Olympus and many more people jumping into the digital camera space. And since more people are getting active, its going to benefit the industry which is a good sign”. With hurried technological changes and embryonic consumer preferences, a righteous cycle of adoption of lifestyle enriching devices, such as cameras has gathered tempo. In recent years, social networking has picked up momentum amongst Indian internet users, giving rise to the trend of sharing photos online. Digital cameras score over their analogue counterparts providing ease of use, ease of sharing content and affordability. This has helped popularize digital cameras; especially amongst young, urban users. Growing competition in recent quarters has led the vendors to launch cameras at affordable price points. This trend is seen to pick up just ahead of the festive and marriage season, backed by heavy promotions in popular media channels. Such cameras have found ready acceptance amongst first time buyers, penetrating the consumer market beyond the metros. The IDC study points to an ever-increasing trend of buying better quality, high-resolution cameras by consumers for personal use. Digital camera vendors are innovating in terms of design, functionalities and technology, churning out products to consumers at ever lower prices. Going forward, we expect this large scale adoption of digital cameras to frogspawn new trends, such as adoption of digital photo frames and home photo printers.